Canada's most affordable and flexible VHS To DVD service. Costs just $15 per video hour for transfer to DVD; extra copies are just $10. Lowest professional transfer prices in Canada, but with the highest quality. VHS and VHS-C to DVD or Computer file. NTSC VHS to PAL DVD. PAL VHS to NTSC DVD. 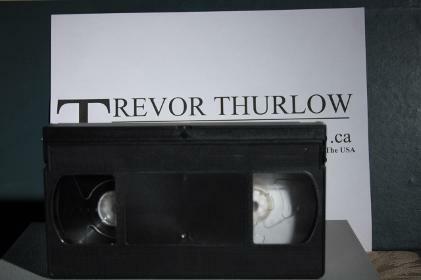 Check out the "About Trevor Thurlow" page for samples of VHS transfers, as I have used VHS to record copies of my community cable channel work, and a few other projects where I was not able to get a digital or high-quality analog copy. Would you like extra copies? Extra Copies cost $10, please specify how many you want. Note: HST/GST will be charged on Canadian orders. Please read our Terms And Conditions which form part of our agreement. Introduced in 1976 by JVC, VHS was brought out to compete with Sony's Betamax format that had been introduced the previous year, in the home video format war, a war that VHS would eventually end up winning. 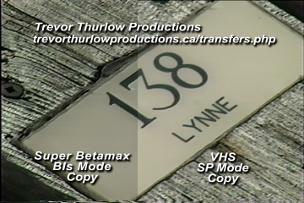 While VHS never managed to offer the same level of resolution as Betamax, due to VHS using smaller video heads than Betamax, when VHS first came out, it did offer 2-hour tapes in it's best mode (SP), which was an hour longer than the longest Betamax tape out at the time (of course in PAL/SECAM markets, VHS did not use the same physical length of tapes as Sony's Betamax system, so Betamax was able to get 60 minutes of video on a L-500 tape [that contained 500 feet/152.4 meters of tape] in NTSC markets [US/Canada/Japan], while L-500 tapes recorded in PAL/SECAM markets [PAL: UK/Germany/Israel, SECAM: France/Russia/Egypt] were able to record 130 minutes; a NTSC VHS T-120 contained 807.087 feet/246 meters, while a PAL/SECAM E-120 contained 570 feet/173.736 meters of tape). So, while Betamax was able to hold a regular 2-hour movie in Germany and the UK, in the US and Canada, at first, companies would've needed 2 Betamax tapes for any program over 1-hour. VHS's luminance bandwidth was between 3.4 and 4.4 MHz, with chroma being stored at 629 kHz; depending on your recording speed (SP, LP, SLP). The slowest speed (SLP) used the smallest amount of storage (3.4 MHz). When compared to Betamax (3.5 – 4.8 MHz luminance; 688 kHz chroma) and it’s improved versions (Super Betmax 4.4 – 5.6 MHz; 688 kHz Chroma; Extended Betamax 6.8 - 9.3MHz, 688 Chroma), or even DVD at 13.5 MHz and a Chroma of 6.75 MHz, VHS was the inferior technology. As you can tell from the two pictures below, when it came to Betamax vs. VHS, Betamax managed to present a better picture in both resolution and color. Originally shot on Mini DV. Any names or people in the photo's are not connected to Trevor Thurlow Productions. These images were taken in a public place. Originally shot on Mini DV tape. Before going any further, any timings and lengths, unless noted, are for NTSC recordings. If you have PAL video that was recorded onto a NTSC-region tape, you need to add an additional 28% time factor (if it's a T-200, and you think it was recorded in SLP you need to go 600 (North American running time in minutes) x 1.28 = 768 minutes). If you have an NTSC recording on a PAL-Region E tape you will need to take away 28% of the time. So for a NTSC recording on an E-240 (4 hour SP PAL) tape in SP you would follow this formula: 240 (PAL minutes) x 0.28 = 67 (it's actually 67.2 minutes, but for this calculation we don't need seconds, so if it's under 5, round down, if it's over 5 round up to the nearest minute). Then take 240 - 67 and you are left with 173 minutes or 2 hours, 53 minutes. With VHS tapes the SP recording length is always used as the type of tape, so if you have a T-/E-120 tape, that means that in SP mode the tapes are able to record 2 hours of video. The T- and E- in the tape type stands for NTSC (T) and PAL/SECAM (E) zones and the amount of time you will get on machines native to those zones; if you no longer have the right box for your tape, or don't even have a box, the easiest way to find out what type of tape it is is to look just over the recording tab (the little square to the left of the spine label), where you will see in purple ink (and on the common black VHS tape it is very hard to see). Sorry, this may seem very technical, but if you are trying to figure out how much time you have recorded on a tape, and you know that the tape is from a different region of the world, your tape would record more or less video than you think it would. 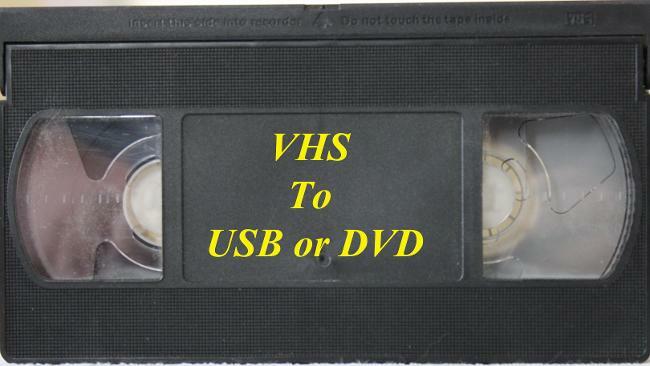 What’s The Difference Between VHS and VHS-C? So what is the difference? Not much. VHS-C used the exact same tape as VHS, but in a much smaller cassette. VHS-C was released in 1982 to offer a smaller size camcorder than Betamax or a full-size VHS camcorder could offer. Of course it's SP recording time was reduced to a mere 30 minutes (NTSC)/45 minutes (PAL); if you were recording your kid's hockey game, this meant that you had better have four or more tapes on you. Please fill out the form at the top of the page and I will get back to you with in 2-3 days. Please be advised that I will not transfer copyrighted, pre-recorded tapes (i.e. Star Trek : The Motion Picture), as I will not be involved in blatant copyright violation. However, if you have a letter or some other form of permission from the copyright holders giving you have permission to have me make a copy or X number of copies, then I will transfer the tape, but you will have to get that permission before any transferring is started! If you have recordings that are of a very personal nature, I do ask that you let me know this before placing the order. 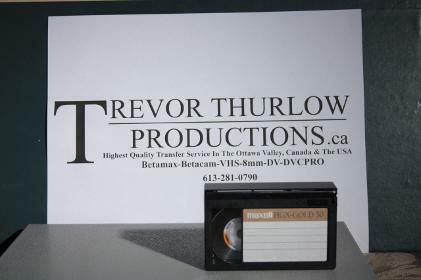 Trevor Thurlow Productions can transfer VHS tapes in both NTSC and PAL formats. To find out the countries that used NTSC or PAL please click on this link. If you are unsure please click Unknown. When you receive your tapes back you may notice that the record tabs have been removed or shifted to the "Off/Save" position. This is the first thing that I do with your tapes so that, even though I don't plan to, should I hit the Record button by accident, the VCR will not enter Record and erase your precious memories. All DVD transfers use Verbatim AZO DVD-minus-R discs. I've used Verbatim for many years and these discs are, by far, the best discs; many other professionals also use this brand of disc. Options include NTSC/PAL VHS/VHS-C to NTSC S-VHS, VHS, DVCPRO, MIni-DV and Betacam SP. Had a vhs copied into a dvd. amazing job. very pleased. - Melody, VHS To DVD Transfer, May 2014. She has since had further VHS transferred to USB Hard Drive.